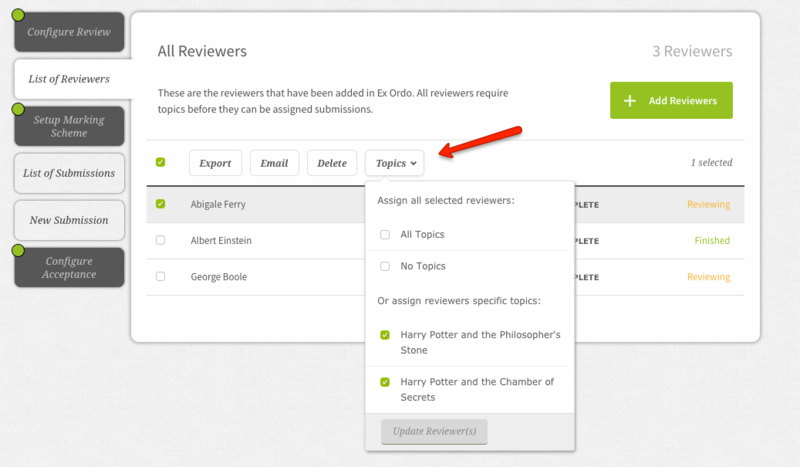 You can use bulk actions to carry out tasks on groups of submissions or reviewers together, saving you lots of time. The available actions depend on the list you are looking at in the system (e.g. submissions, review or reviewer list) and on the state of the conference (e.g. before or after allocation). Under the 'List of Submissions' in the Submissions, Review, Programme or Presentation hubs you will see some tick boxes at the beginning of each list. Tick the boxes to select individually, or you can click on the master checkbox at the top of the list to select the entire list. Export the selected submissions to Excel. Reinsert them (if previously withdrawn). Export the selected reviewers to Excel. Send an email to the reviewers through the communication hub. Mark them as 'Do Not Review' - this will mean that those submissions won't have reviewers allocated to them. Set them as Do Not Review. Clear Allocation - this option removes the reviewers from the selected submissions. This means you will have to reassign reviewers to the papers manually. Choose 'Do Not Review' - this will mark the submissions not to be reviewed. (This pushes the submissions to jump to the decision stage and the drop-down to Accept/Reject will appear). 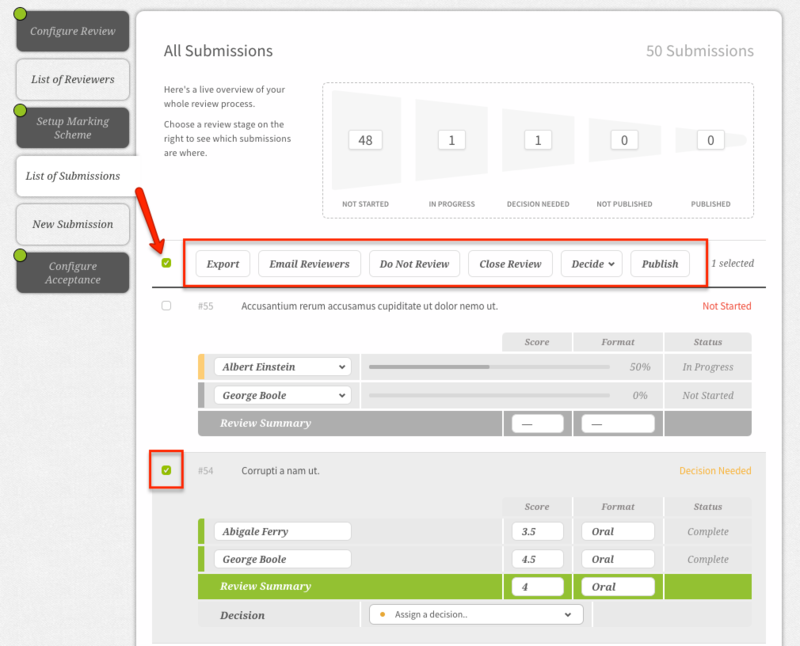 Close Review - If the selected submissions have been partially reviewed and you decide not to wait for all the reviewers to complete, you can use this functionality to push the submission into the decision stage. Decide - this functionality will appear once the reviews have been completed. You can use it to mass accept/reject them. Confirm/decline RSVP for selected submissions. You can also use filters in the lists of each hub. See here to learn more about this.